My husband and I have two sons who have both been diagnosed on the autism spectrum. Our first diagnosis came about 12 years ago this summer, and I can tell you that like all the other autism parents I know, we immersed ourselves in information once we got the diagnosis. It can be overwhelming — there are books on diets, behavior modification, medications, personal stories, not to mention the vast realms of info (much of it crap) on the Internet. I cannot claim to have read all the “important” books about autism; after a while, I started to feel all autismed out. But there are a few gems that really helped me as we learned how to parent our very unusual but fascinating boys. Temple Grandin, perhaps the most famous autistic in the world, and her mother Eustacia Cutler have both written books about autism and about their personal experiences of it that I thought were superb. John Elder Robison’s “Look Me In the Eye” is another winner. Robison was diagnosed with Asperger syndrome when he was an adult, and his diagnosis helped him understand himself and his struggles and successes. Reading the perspectives of people who are on the spectrum is always interesting to me, and so when PattyKates mentioned that her cousin who happens to have autism had written a book, I couldn’t wait to get it. Robbie Clark’s book joins my list of gems. This is a book I would recommend to fellow autism parents as well as to teachers, students, and members of the larger community. 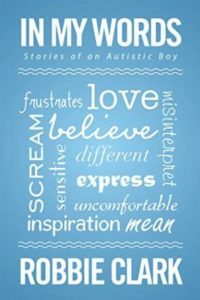 Robbie’s perspective is unique; he is only 22, which makes him much younger than either Grandin or Robison were when they first started writing about autism. I think this is enormously helpful, as he is closer to his experiences of childhood and school — two areas where parents often have a lot of questions. Another distinguishing feature of In My Words is the fact that Robbie’s parents and his sister provide their own perspectives in the book. It is an uplifting yet realistic picture of a family that has worked hard and worked together for Robbie to succeed. Not being let into art in eighth grade was just like so many other times in my life. Like when I was a pre-schooler and many schools not taking me because I didn’t fit in. To me, this was a way of people telling me I was not good enough. Robbie tells some really interesting and tough stories about his school years, about teachers and students not understanding him or being fair. His parents and sister corroborate some of these incidents, too. But several really positive things stand out from Robbie’s narration about his school years First, he had some outstanding teachers and administrators in his corner, whom he mentions by name. These are people who saw his potential and helped put in the accommodations that allowed him to succeed. Second, Robbie’s parents are amazing. They worked to find the right place for Robbie so that he could attend school with his sister and with typical kids and really be pushed to be the best he could. His parents went so far as to move out of state to find the right placement for him. And finally, Robbie’s sister Emma and his classmates were excellent friends to him. Robbie and his family recognize that Robbie’s friendships are not exactly typical. He notes that he never had a big group of friends to hang out with like his sister did. Yet, he also names kids who included him in their fun and watched out for him and helped him. I can tell you that that is not a universal experience for kids with autism, but I wish it were. After graduating from high school, things changed for Robbie. Many of his friends moved off to college and jobs. His parents express their concern about his future, his ability to be independent and to be happy. Robbie works for his dad’s company and is a hard worker, as many people on the spectrum are. His sister Emma provides a very poignant reflection on being Robbie’s younger sister but often feeling that she is the elder, that she has to watch out for him and protect him. What they all seem to get, though, is that Robbie has to be allowed to be independent, to try things on his own; they recognize that he is quite capable and an overall happy and joyful person who has a gift for spreading that joy to others. At the start of the book, Robbie writes, “My hope for this book is to give encouragement to others like me and to their families who are beginning this journey.” Mission accomplished! I would love for Robbie’s book to become part of the curriculum at our middle school or high school. I think kids on the spectrum would really appreciate his ability to put into words all the complex and sometimes inexplicable feelings he has had, and I bet they would identify with many of the situations he describes. Typical kids and teachers could get a new perspective on their own roles in the lives of kids like Robbie — kids who defy the norms and have so much to offer. This book could bring about some enlightening dialogue among students and staff. Cool side note — some of the profits from the sales of this book go to support Merrimack Hall. They run some great programs for kids and adults with disabilities, and have supported Robbie’s artistic talents, including his writing. He calls Merrimack Hall his new home, so they must be awesome. Check it out at www.merrimackhall.com . Share the post "Listening to Autism"
Please do! I am a fan. I think I might purchase extra copies and just donate them to my boys’ schools. Gotta get the ball rolling somehow!